Do you know what that is? That’s homemade bread, baby. 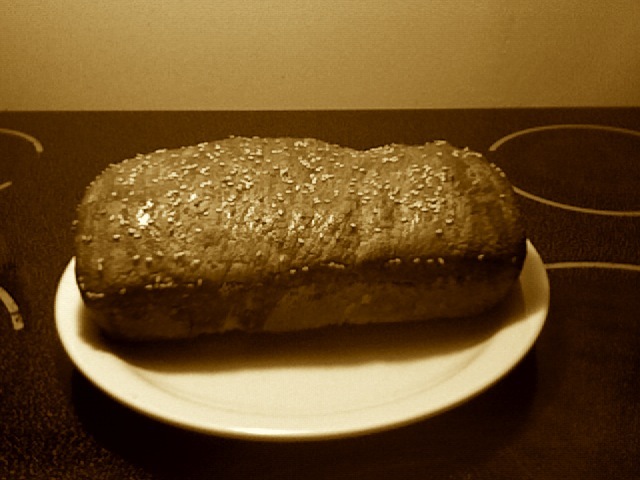 And not just homemade bread, but homemade raisin bread with a glaze of honey and topped with sesame seed. My good buddy Ben bakes bread all the time. You should go over to his house. Whatever he’ll feed you is like the happiest day of your life – in your mouth. I stood in awe of his bread-baking abilities. He’s like a super-hero. And then he told me it was easy. For months I thought about how wonderful it would be to make my own bread. For months I toyed with the idea, looking up ingredients and imagining the horrible, day-long process it would take to make a loaf that probably would turn out to be crud. I looked at the ingredient list from the cookbook. It looked pretty simple, actually. Then I looked at the ingredient list of a normal loaf of bread from the supermarket. Quite different! It looked like something Professor Snape would put into his potions. And then I started the Wellness Challenge. I imagined that I shouldn’t be eating anything I couldn’t pronounce or identify at sight. So I caved. I rolled up my sleeves, grabbed the ingredients and make some bread. I was shocked. After 15 minutes of work, I was practically done. And I didn’t even use a breadmaker! How did it turn out? Well…within eight hours the entire loaf was gone. And that glorious picture of the raisin bread of glory? That was my second try. Boo ya! What does this mean? It means that it’s not hard to do it yourself! Why did it seem so hard? Because I (like you) have been born and raised in a culture where we never do things for ourselves! We never make real food! We never do our own work! Heck, with the rise of video games and MMORPGs, we don’t even use our own imaginations! Make some bread! Do something yourself! It’s better for you. It’s better for the world. It’s just plain better!